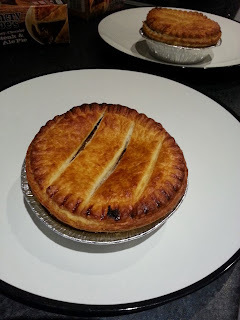 Joe 1 and Joe 2 (aka Pierateer RAS and Pierateer TJP respectively) had the pleasure of trying two Hungry Joe's pies, which were a new addition to the ASDA pie section. Joe 1 (aka Pierateer RAS) opted for the Hungry Joe's Steak and Ale pie, while Joe 2 (aka Pierateer TJP) slammed a Hungry Joe's Chilli Beef pie in the oven. Watch the video below to see what happened when the two Pierateers sat down to rate their pies! First of all, let's start with the objective facts. The pies cost £2.48 each, slotting these pies in at the mid-range price point. While they were clearly aimed to serve one person, these pies are still quite large - weighing in at 320g. Joe 1 (Steak and Ale): The puff pastry lid was nice and golden, and it was a pleasure to be able to pick up the pie without cutlery (see video for evidence). There are a growing number of pies for which picking up and taking a bit is not possible, so were were glad to see that Hungry Joe's was going back to basics with a pie that you can pick up and munch on. This was a very strong positive. The filling was relatively good, with tender meat but slightly gristly and chewy at points. The ale gravy was very apparent and complemented the pie well, with a good capacity. Joe 2 (Chilli Beef): Hungry Joe's had me hungry for pie. I was nearly as hungry as Joe after watching my pie cook (from frozen) for 50 minutes in the oven. But boy, I was glad to finally pick that pie up with my hands and start eating. As you can see from the video, it was quite hard to tear myself away. Definite plus points are scored by ability of the pie to hold itself together despite me picking it up and mauling it with my hands. The pastry was a lovely golden brown colour after it came out of the oven, with a nice caramelisation to the lid. This is a decent sized pie, although £2.48 is still fairly pricey compared to other supermarket options. The filling wasn't anything particularly impressive. Although the box promised that the chilli would be "fiery hot" and used an icon of three chillis to really strengthen this point, the pie was actually not that hot at all. Overall, it felt a bit as if someone had taken some reasonable chilli con carne and encased it in pastry. The end result was a bit wet and sloppy. However, it did taste fairly nice, and the puff pastry was of good quality. There was not much air in the pie, giving a very pleasing air:filling ratio. The pie was large and the capacity was very generous.